Most of the reviewers were impressed with the sneaker’s stylish look. Several wearers commented on the shoe’s durability. Some of the reviewers are happy with the sneaker’s versatility, pronouncing it to be suitable for everyday use, playing sports, fashion, or just for lounging. Many reveled in the shoe’s classic design that has literally transcended decades. A lot of the wearers were happy that the shoe went well with practically any outfit. Some users remarked on the sneaker’s good fit, being true to size. A handful of the reviewers were happy with the shoe’s affordability, commenting on the good price for good quality. Some praised the shoe’s nice colorways. A few made mention of the Air Force 1 07 Mid’s great, well-made quality. Looked awesome strapped or unstrapped, a buyer remarked. The shoe provided good ankle support, a few observed. 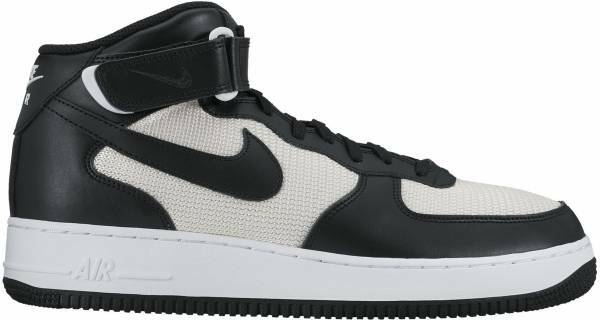 The Nike Air Force 1 07 Mid runs a bit large, a handful of users advised. The leather creased easily, a few unhappily remarked. If worn with jeans frequently, the jeans, faded onto the shoe, a couple of reviewers observed. A handful of reviewers noted that the shoe is difficult to get on when not yet broken in. Walking in it, the shoe made a squeaking noise when strapped down, a couple of wearers were annoyed. For those who go for a classic style without sacrificing comfort, the shoe's timeless silhouette will likely fit the bill. In terms of style, the Nike Air Force 1 07 Mid brings about a lot of possibilities with its ability to go well with diverse outfits. Versatility is also one of the shoe’s strengths, being stylish enough to go out in while being good enough to play hoops in. The sneaker has also been proven to be comfortable enough as an everyday shoe. First look / Unboxing | Hey Ozzy! Launched in 1982, the Air Force 1 was originally meant to honor the aircraft that carried the US President. It was designed by legendary Nike shoe designer Bruce Kilgore, who came up with groundbreaking features, including the circular outsole pattern instead of the traditional herringbone traction pattern prevalent at the time. The new outsole design was specifically created with basketball players in mind, given their pivot move on the court. This made Air Force 1 a true basketball shoe. It was also the first pair to utilize the celebrated Nike Air Technology, a pocket filled with air in the heel for cushioning and support. Although the shoe became an instant hit and demand for it remained high, production was discontinued in 1984. At the time, Nike would create a product, then moved on to make something new and better, always looking forward and never going back. However, Air Force 1 fans were clamoring for the shoe so that distributors started requesting for Nike to re-issue the sneaker. In general, the Nike Air Force 1 07 Mid has met buyers’ expectations, staying true to its roots with its massive midsole and soft, springy cushioning. Unlike the first Air Force 1s which were high-tops, this version has a mid-top silhouette. Its upper is made of leather and textile, a combination that is known to offer excellent durability along with style. In general, the sneaker offers style while being true to its origins. Strategically placed in the forefoot and heel, the shoe’s pivot points allow smooth transitioning in whatever direction. This feature highlights the sneaker’s rich basketball legacy. Also, indicative of its excellent breathability, the sneaker is designed with perforations on the toe front to help keep the feet dry. AF1 fans can certainly sport the shoe’s classic style without sacrificing comfort. For the more adventurous, the sneaker is available in a wide range of colorways. For those who prefer to keep things clean and simple, as most of the shoe’s fans evidently do, the monochromatic colorways would be the way to go. The combination of leather and textile for the shoe’s upper provides a comfortable fit, while its signature ankle strap yield lockdown support. The sneaker is available in both men’s and women’s versions. The men’s versions are offered in sizes 6-18 while the women’s variants are available in sizes 5-12. In general, the shoe runs true to size. The shoe’s metal tag on its lace that reads “AF-1 ‘82” stands out. This small feature adds character to an already distinctive silhouette. No matter which direction the wearer turns, the sneaker’s pivot points on both the forefoot and heel afford smooth transitioning. Along with comfort and style, the leather and textile upper lends durability to the shoe. For a fee, the sneaker can be customized and personalized. Like many of Nike’s basketball shoes, the Nike Air Force 1 07 Mid has a non-marking rubber which makes exceptional traction possible on different types of floor surfaces. This also gives the shoe the ability to withstand frequent and tough use.